Projector headlights are high performance headlights that were originally only available in luxury vehicles. They are capable of using extremely bright high-intensity discharge (HID) and light emitting diode (LED) bulbs that would be unsafe to use with traditional reflector headlights. Due to the way projector headlights are designed, they are capable of illuminating more road surface, at greater distances, than traditional reflector headlights. They project a more focused beam of light than reflector headlights, which means more light is cast directly ahead, where it's needed, and less spills out to the sides where it isn't. Projector headlights consist of a headlight assembly with a replaceable bulb, just like reflector headlights. They also include a reflector component, but that's where the similarities end. The overall design of projector headlights is based around the idea of focusing light with a specially-shaped reflector, then using a shutter to project it on the road with a beam pattern that is evenly-distributed and tightly-organized. Bulb: Every headlight needs a bulb, and projector headlights can use halogen, HID, and LED bulbs as the light source. The bulbs in projector headlights can be much brighter than the bulbs in reflector headlights. Reflector: Like classic reflector headlights, projector headlights actually include a component called a reflector. The difference is that they use an elliptical-shaped reflector instead of a parabolic-shaped one. The difference in shape causes the light emitted from the bulb in a projector headlight to focus on a narrow point near the front of the reflector, where it meets a shutter. Shutter: The shutter is one of the most important components in a projector headlight, and it's something that classic reflector headlight housings just don't have. This component is inserted into the light beam from below, which causes a sharp cutoff and effectively aims the light at the road instead of allowing it to blind other drivers. In some vehicles, the shutter can be raised and lowered to switch between high and low beams. Lens: This is the final component found in projector headlights, and it's designed to evenly distribute the beam of light that has already been shaped and aimed by the elliptical reflector and the shutter. Some projector headlight lenses also have a feature that softens the cutoff line between light and dark when the headlights shine on the road. Halogen projector headlights: The first projector headlights used halogen bulbs, just like reflector headlights. These headlights typically project a more even beam of light than reflectors, with a sharper cutoff between light and dark, even though they use the older halogen bulb technology. HID projector headlights: The second type of projector headlights to arrive used HID bulbs, and they are still available today. These are also known as Xenon HID headlights. They're much brighter than traditional halogen bulbs, and they also last longer. In most cases, it's a bad idea to put HID bulbs into projector housings designed for halogen, because they're so much brighter. LED projector headlights: These are a more recent innovation. They're very energy efficient, and they last far longer than either halogen or HID headlights. If they're never damaged in any way, LED projector headlights can even outlive the operational lifespan of the vehicle they're installed in. Halo or Angel Eye projector headlights: This refers to the distinctive ring, or halo, of light that you see in some projector headlights. Even though manufacturers sometimes refer to these as halo or angel eye projector headlights, the ring itself does not use projector technology. These rings are created with about a half dozen different technologies like cold cathode fluorescent lighting (CCFL) tubes, LEDs, and even incandescent bulbs. Since most headlights use either a reflector or projector design, it's only natural to wonder which one is better. More and more vehicles come equipped with projector headlights each year, and you can also retrofit an older vehicle with projector housings, but should you? 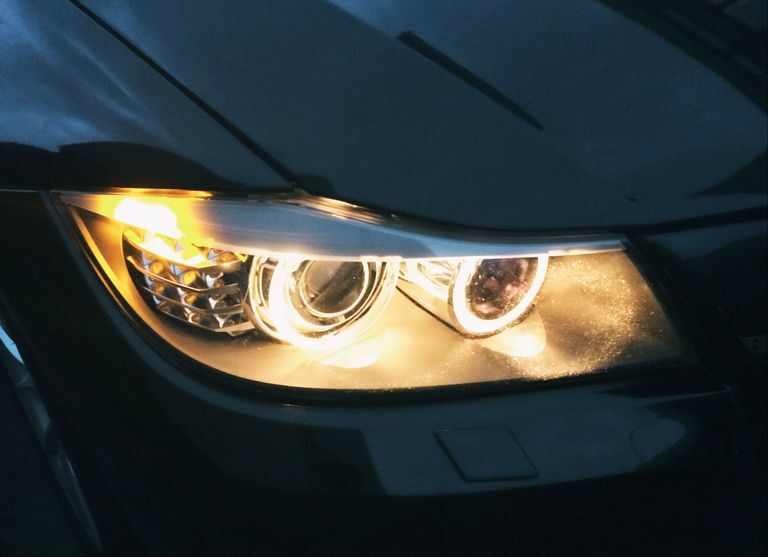 Projector headlights have a lot of benefits, and only a few drawbacks. Less likely to cause night blindness in other drivers. More even light pattern and fewer dark spots than reflector headlights. They cost more than reflector headlights. The headlight assemblies tend to be deeper and take up more space. Improperly retrofitting an older vehicle can be dangerous. When looking at new vehicles, it's almost always a good idea to go with projector headlights instead of reflector. There's more of an argument when you look at HID projector headlights versus LED projector headlights, but the only thing reflector headlights really have going for them is that they're cheaper. Aftermarket projector headlights have all of the same benefits of the original equipment projector headlights that come already installed in new cars. They also have some unique problems, all of which have to do with the differences between reflector headlight housings and projector headlight housings. Do not install projector headlight bulbs, like HID bulbs, in reflector housings. Doing so can blind other drivers, because HID bulbs are extremely bright and reflector housings do not control the direction in which light leaves your vehicle. The difficulty associated with retrofitting reflector headlights with projector headlights depends on the type of kit you want to use, and the types of kits that are available for your car. When a replacement projector headlight assembly is available for your vehicle, that makes the job a whole lot easier. If you've ever replaced a damaged headlight assembly when your headlights stopped working, it isn't that much more difficult to install a projector headlight assembly. There is still some wiring involved, but some kits include plugs and adapters so that you don't need to cut or solder anything. In cases where a projector headlight assembly isn't available for your vehicle, the other option is to use a universal retrofit kit. These kits typically come with reflectors, shutters and lenses, which need to be installed inside your existing headlight assemblies. Retrofitting an existing headlight assembly can be a difficult job, because you need to remove assemblies, gently take them apart, and then replace the internal reflector with a new reflector, shutter, and lens assembly. The assembly then needs to be resealed. Unlike kits that are designed for a specific make and model of vehicle, universal projector headlight kits usually require you to cut and solder wires to install the new electrical components that are needed to power your new HID or LED bulbs. Model-specific and universal projector headlight kits are both perfectly safe as long as they are installed correctly. Since they include modified reflectors, shutters, and lenses, they work just like the projector headlights that you would get if you bought a brand new vehicle.